Chad walked to a park near my house to read while I was teaching on Wednesday morning. We ate lunch at home during my 2-hour gap, then I was back at school for my afternoon classes. As soon as I finished, Chad and I headed to downtown Sol for his first churros con chocolate. 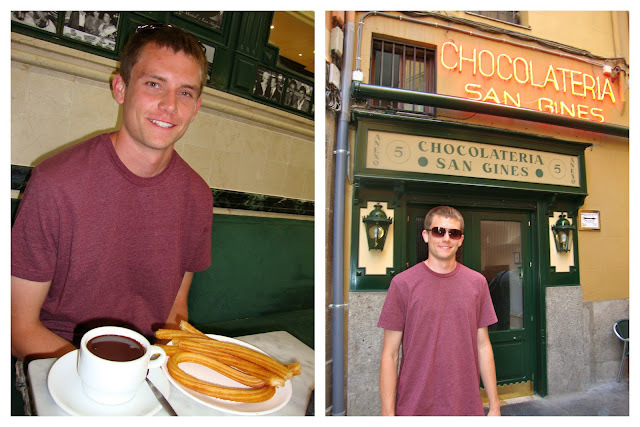 We got the churros at the famous Chocolatería San Gines. Since I shouldn't eat the chocolate nor the fried churros due to my digestive disorder, I usually never eat churros but I had a couple of bites that afternoon. The chocolate wasn't very sweet, which I think is what allows you to keep dipping all six of your churros in it. While walking from Sol to Ópera, I bought a pair of flip flops and blue flats from natura. Those two items have been on my mental "to-buy" list for far too long, and having the flip flops for Alicante's beach that weekend would be nice. We walked north, making our way past Plaza de España to Madrid's teleférico in Casa del Campo. I had taken the teleférico once before with my Spanish friend Sergio in 2009. Chad and I took the teleférico across the large park and back, while seeing great views of Madrid. 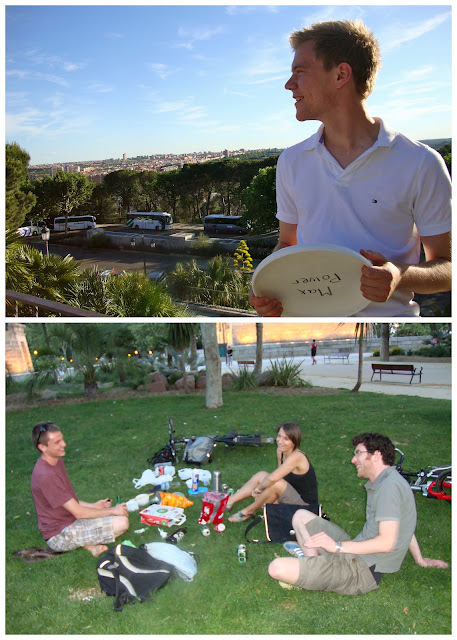 Once back where we had started, we walked to Madrid's nearby Egyptian Templo de Debod where some frisbee friends met up with us. We sat in the grass, munching on various snacks. Soon over half the group had left the circle and was on their feet throwing discs nearby. Later I ended up making a quick run back to that good Chinese restaurant underneath Plaza de España. Chad had wanted to eat there again at least once more before he left, so I got some chicken and rice and brought it back to the park. We didn't stay out too late; I had to be up at 7 the next morning to teach, and then pack for our weekend in Alicante.